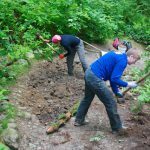 Entering the second half of the year, the North Shore Mountain Bike Association (NSMBA) Trail Adoption Plan has hit full stride. Already this year, a tremendous amount of work has been completed with TAP collectively accounting for a total of 40 trail days to date. An army of community driven volunteers have taken up the charge with shovels, pulaskis, Macleods and mattocks, led by 15 TAP Builders. 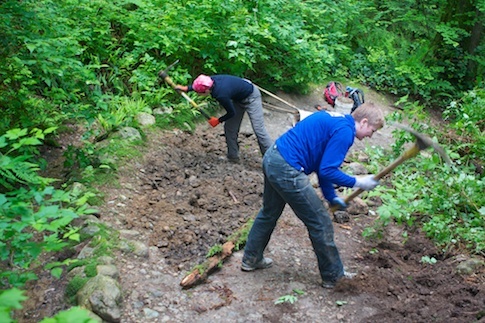 Never before have the trails on the North Shore seen such a concentrated amount of work in such a short period. Now into its second season, TAP has doubled in strength from 2011, the year of inception, to a total of 22 Adopters. 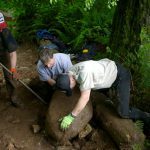 Community groups, bike shops, bankers, lawyers and accountants, riders and runners, all passionate about our mountains, have been busy revitalizing 18 trails to their former glory. 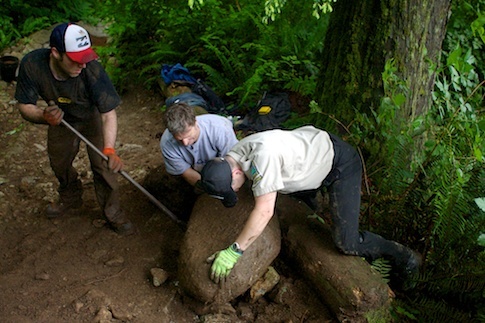 The work also lessens our footprint by decommissioning braids, narrowing the trail bed and minimizing tread creep. 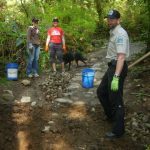 Using modern building techniques, water dispersion has been implemented on the trails to counter its erosive properties, one of our greatest challenges in our temperate rain forest. 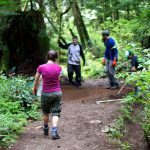 Taking the environmental high road every step of the way, TAP work avoids tree root degradation and corrects alignment issues to minimize impact with the final step being beautification of the trail with planting of ferns, salal, huckleberry and moss. The ultimate goal is aimed at creating a positive user experience while being harmonious with the above principles. 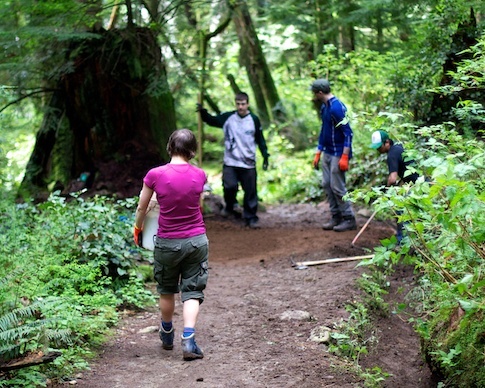 Empress & Empress Bypass, two trails within BC Park’s borders, are currently getting a needed facelift thanks to Adopters Different Bikes and NSRide, led by NSMBA Builders Daniel Lui and Darryl Marlatt under the guidance of Robert Wilson, Senior Park Ranger with BC Parks. 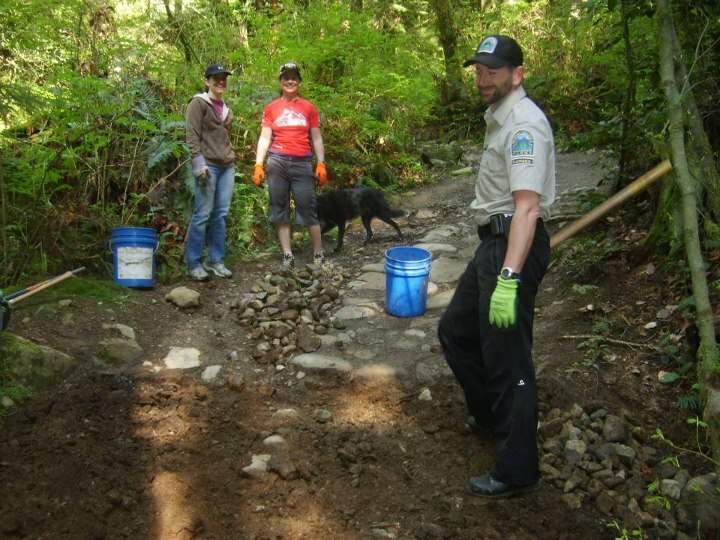 The Adoption team is creating a more dynamic trail experience, correcting drainage issues and addressing significant speed issues on what is a multi use utilitarian bypass-another win-win for all. Keep in mind some of this work is less than glamorous, including the clearing of ditches and culverts; admirable work that serves the greater good. The NSMBA would like to thank the TAP Adopters, the TAP Builders, BC Parks, the District of North Vancouver and Metro Vancouver LSCR for their support and shared vision. We would also like to thank the community at large for your patience and understanding as we continue the work to make things better for everyone. Working together we can accomplish great things. The NSMBA would also like to thank TD Friends of the Environment Foundation for their financial support of TAP. TD Friends of the Environment Foundation is proud to provide much-needed funding to help sustain local environmental projects.